Please see below for comments and pictures. 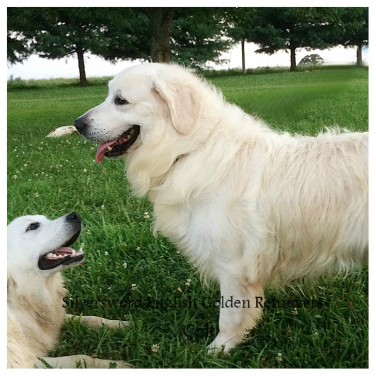 Reserve list for the Winter 2017 Litter of Champions Colt and Orcrist's Litter of English Cream European Golden Retriever puppies. The puppies say their goodbyes! This has been a big week for the puppies. They all have new homes now. Also, they are being crate trained and doing excellent. They are up to eight hours with no accidents now. Actually, there has only been one accident total from the first night so this is a very good group! They have also had their six week shots and microchip. Orcrist has begun the weaning process--yes, she controls that--so they will be completely ready for life without her. They are beautiful, friendly, and such a fun group. It has been wonderful to meet will all of the new homes and though I will miss the puppies, it is nice knowing that they will be going to homes where they will be totally loved! Bonus Video: this is why we will miss these puppies. We love to be with them, hold them, pet them and cuddle with them. They love all of that and more! Adopted by Michael & Debora S.
Arrow is a sweetheart. He is calm and loving. He likes to be with us. Adopted by Kerrie & Mark H.
Batman is our most calm puppy. He is big, sweet and loving. He really enjoys being with us. Adopted by Bill & Jessica H.
Flash is very balanced. He loves being held and cuddled and also loves exploring. He is likes to play tug-of-war with us. Superman is very active and loves to play. He has lots of personality. He is fun, playful, and beautiful. Caitlin Snow is our sweetheart! She loves being petted and will come to us and sit with us always. White Canary is very balanced. She likes to play. She likes to explore. She is very sweet. Adopted by Mark & Teresa W.
Wonderwoman is both active and loving. She likes to be petted and held. Arrow is playful and loving. He likes to crawl into our laps. He will explore his world fairly widely now. Batman is our largest boy and he is also beautiful. He likes to explore but is still one of the most relaxed puppies from this group. Flash likes to explore but also likes to be near us. He is playful and enjoys running around our place. Superman is super playful. He loves to playfight and explore. He has lots of personality. Caitlin Snow is super sweet and loves to be with us. She loves everyone and is also playful. She had a good week of growth (for her). Supergirl is playful and fun. She likes to be held and petted. White Canary has a balanced personality. She loves us and and is very beautiful. Wonderwoman is a sweetheart who loves to cuddle and be held. She is very affectionate. She likes to explore. Here are the results of the personality test. As I try to say each time I write these, the puppies are very young to be completing these tests so some activities (fetching) are beyond their ability because they can't even grasp the paper yet (though 3 of them tried). All of them have the first stages of this down--they are interested in it and go to it immediately--which is a really good start. Also, none are touch sensitive in the way the test expects. They do not pull away. They simply licked me (2 of them) or made a very small movement of their body to change their weight. It is really very cute because you can tell they don't know why I am doing this to them but are still content to let me do it. Finally, we work to condition our dogs to odd positions, sounds, and sights so many of these tests are incredibly easy for them. I have used videos today to give you a better idea of what each puppy is like. I have tried to get a good front view for most of these videos, though the first couple taken (not alphabetical) I didn't think about it. Arrow is very sweet and loving. He is relaxed and likes to be held. He has occasional playful moods, but prefers being with us. Batman is very relaxed and loves people. He can be playful at times (Keaton's comment). He is big and beautiful. Flash is very relaxed and cuddly. He loves to be held and petted. He is a melt in your arms puppy. Superman is the most playful (by far-both Keaton and my observation). He likes to play with the other puppies and he loves to play with us. Caitlin Snow is the most loving puppy. She loves to come up and be next to us and will just lay her head on our legs. She has times of higher activity too. Supergirl is both active and cuddly (she likes eating toes). She has a well balanced personality with times of curiosity and times of relaxation. White Canary is also playful. She likes to play with our feet and legs. She is beautiful and very loving. Wonderwoman is both cuddly and active. She likes to play with her siblings. We woke her up for testing so she did not complete the activities fully. Everybody is doing great and continuing to grow and get cuter by the day. We had our first visit to pick out puppies and they ended up getting a second! The puppies are incredibly beautiful and are so much fun. I have individual comments and their new weights below. I have begun their personality testing and will have it completed and posted on Friday. 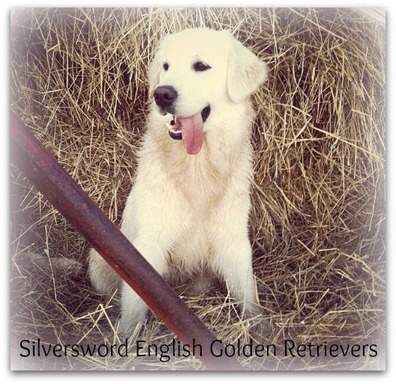 So far, all of the tests I have done (the easy ones) have been very consistent with what is typical for Golden's. They are so sweet, loving, and trusting that some of the tests are hard to do (pinch between their toes) and even then, they don't pull away--they lick me. Truly, balls of love! Arrow is playful and enjoys play-fighting with his siblings. He has lots of energy and also loves to explore. Batman is very relaxed and loves to be held and petted. He is our biggest puppy but he is not at all dominant--he much prefers a relaxed setting at this point. Flash likes to explore and is very confident. He also loves to run around and play. Superman is playful and likes to be with us. He enjoys being held and petted but also loves playing with his siblings. Caitlin is our mini and she is full of energy. She likes to explore and check out new things. Despite being much smaller, she will play with any of her siblings. Supergirl likes to explore and to play. She has lots of energy and enjoys life. She is our first puppy to learn stairs. White Canary is playful and enjoys her siblings. She is our largest female and is very confident. Wonderwoman also does stairs now and she will explore widely without reservation (confident) She likes to play as well. The puppies will be 5 weeks tomorrow! Orcrist is doing fantastic and totally loves her puppies. The puppies are all very healthy and active. They are starting to show their personalities more too. I will be adding comments to each puppy again--just remember that these are still glimpses. At this point, they will sleep for about an hour and be awake for 1/2 hour. Occasionally, they will be awake longer (morning). As a group, they are all incredibly friendly and seem very smart. I will be posting pictures a little later today. Arrow loves to cuddle. He will sit in my arms as longs as I let him. On the ground, he is confident and likes to explore. He is very white in coloration and a bit smaller. Batman likes to play and is also a confident puppy. He likes attention and to be with me. He is larger, with a nice head shape. He likes to play with Arrow. Flash loves to sit in my lap. He will turn so he can stare me in the eyes. It is so cute and heart melting! When I am forced to put him down, he likes to play and explore. Superman is big and blocky, with a cute face. He likes to be held and is very relaxed. He likes to just hang out near me at this point, and likes to play with me. Caitlin is our little darling. She loves playing with Supergirl and exploring. She has lots of energy but still enjoys being held for as long as I will hold her. Supergirl is good sized for a girl and well proportioned. She likes to explore and to play with Caitlin. She is fairly independent but likes to be with us (like her mother). White Canary likes to be held and petted and also loves exploring. She is playful and smart. Wonderwoman likes to be with us. She likes to explore and is very confident. All of the puppies are healthy and are continuing to grow at a good rate. They are beginning to show more of their personalities--though that will mostly emerge in the next 3 weeks. So far, all of the girls love to cuddle and be held. My boys like to be petted but also like to explore. Arrow likes to explore and seems very intelligent. He also loves to be held but will find things to do on his own too. Batman is our second biggest boy. He enjoys being held and petted under his neck. He is inquisitive as well. Flash loves being held and petted. He is a melt in your arms puppy, at this point. He will explore but he prefers to be with people. Superman is our biggest boy. He likes to explore and he seems intelligent. He enjoys sitting on my lap as well (though he wanted to play with me, more than cuddle-except for the neck scratch--that trumped all). Caitlin Snow is my most active girl and she also loves to cuddle. She continues to grow at a good rate--behind her sisters but consistent. She is my most explorative puppy, too. Supergirl is very relaxed and loves to be with us. She is extremely friendly and will sit with us/on us. She is sweet girl! White canary loves to cuddle! she will sit in my lap for any length of time and just melt. There is a special spot under her chin that makes her leg thump up and down. Wonderwoman is a beautiful girl who also loves to cuddle (I think you see the trend here). Of this litter, which is extremely white, she has the most color (which would still make her whiter than any of Tizona's puppies). The puppies have just received their names so I don't have any individual comments for them today. Their weights are posted so you can begin comparing their sizes. Hopefully the pictures will help. One puppy does get comment-Caitlin (Mini). She was a little slower than the rest to begin walking and now she pretty much runs everywhere (I think she is the only one to run). They puppies have also begun to play with each other. I have seen a couple of light tussles between them--that is so fun (for them and me). This was a particularly photogenic day for the puppies so there are 10 pictures to enjoy! Mama and puppies are all doing very well. They are such a fun group. They get along really well and are very snuggly both with each other and us. They love to be held and will fall asleep in our arms/laps. I will be naming them between now and Thursday, when I plan to do the next group of pictures. These are beautiful puppies and I can't wait to show you each of them. They are all eating solid food now and have begun to drink water too. They still get most of their food from Orcrist, though. They walk around a lot now, so they will begin exploring this week. This is really when their personalities will begin to emerge--which will take several weeks. So now is when the fun begins! It is hard to believe the puppies are already 3 weeks old! They are all doing very well. Mini continues to grow and it is amazing to see that Orcrist still helps her. She does compete very well, though, and I have seen her in there with her big brothers and sisters--not giving way to them at all. All of them have begun eating solid food. Yesterday, 2 fell asleep in the food bowl. This is just the start of eating solids and this will be a big transition week for them. Also, they are crawling around quite a bit now and beginning to explore their room (so that means my work increases again). By next week, they will have names and I will begin their individual pictures. The puppies will be completing their neurological stimulation program tomorrow. These are very relaxed puppies. Typically, I will get 2 or 3 out of 8 that will have higher startle responses and the same number (though not the same puppies) who will squirm and wiggle in the various positions. All 8 have been calm, relaxed and seem to enjoy being held in all of these awkward positions. If this is going to be consistent later, these will be melt your heart puppies! All are growing well and look beautiful. They crawl now and their eyes are open. They have not yet started eating solid food but that should happen by next week. Also, next week I will be picking their names and getting collars on them (except for Mini) so that I can start posting pictures. The puppies have been doing fantastic. They are active, healthy and beautiful already. Orcrist continues to be the best mother ever. She loves them and seems to know what to do always. Mini is doing really well. She is still small compared to the others but is growing at a good rate and is very competitive. The neurological stimulation with this group makes me think that they will be a slightly more relaxed group-especially for Orcrist puppies. Orcrist continues to be the wonder mother. She is so smart! We have been concerned for the tiny puppy (we call her Mini). Typically, runts do not nurse well, miss out on colostrum, fall farther and farther behind and then they face health issues (which is why we will not take a fourth reservation yet). So Judy and I have been putting Mini on to nurse every time we visit (between 15 and 30 minutes at the longest). Now we find Orcrist picking out Mini and feeding her by herself. She knows what we want and is doing it without us! I have a picture posted of Mini between the 2 biggest puppies so that you can see the size difference. Also, there are 2 ways a runt can come about. 1) There is some type of defect that prevents them from growing properly. 2) They are from a later tie (dogs will go into several) so they are actually days younger from conception. Based on her eating, Mini seems to be younger from conception which I hope means she will remain healthy and eventually catch up to the rest. The puppies have had their dew claws removed (except Mini). They are fat and happy. They have begun the neurological stimulation as well. I will post more on this as they age and give me a clearer picture of their tendencies. Everyone is still doing great. Orcrist is such a good mother. She moves them in and out of the heat as she judges their needs. All of the puppies continue to nurse well, though she still just has colostrum. They will be very happy when her milk comes in and their bellies are completely full. Orcrist is so very smart about how she mothers. She seems to understand the needs of each of her puppies and she will spend time with them one on one. She will take one puppy, put it between her front paws and lick and love on it before doing the same with another. All of the puppies are nursing well. I am still on night duty (I will wake up every 1/2 hour tonight) to make sure that they continue to stay warm (they need to be in 90-95 degrees right now) and eat. This is the time that they can get colostrum which is essential for them so we have purposely ensured that they are all eating. Our little puppy is active and nurses well so for now that is great news. Hopefully tomorrow I will get some pictures up. They are really cute and Orcrist is very content. I woke up this morning to puppies! Orcrist had 2 puppies at that time (7:00) and now has 7 (as of 9:00). One is quite small so we will have to see if he will be able to compete or not. I will try to determine their sexes once they are dry. Orcrist is doing great and as always, is so content now that she has her puppies! She is at 8 now (9:30) and has 4 boys and 4 girls.